The best value for your weekend entertainment $5 in Dayton with a mix of comedy from 1st timers, to rising stars working on new jokes, & a pro headliner closing. Come to take a look, or take part! If you're friends think you're funny, we want to meet you. If you like to laugh, we want to entertain you. Performing on the same stage that held, Drew Carey, Chris Rock, Chapelle, Ellen, Emo Phillips, Bill Hicks, and more, Wiley's Sunday Comics is a mixture of local amateur comedians and nationally touring professionals, and even first-timers, working on their craft by performing in short sets. Some are showcasing for future work at the club and others are working out new material to get it perfect for weekend shows on the road. Some are checking an item off their bucket list. For 35 years, Wiley's has supported live stand-up comedy and encouraged and instructed young performers in their dreams, often giving them their first paid jobs as an MC right here at Wiley's. Come see the Stars of Tomorrow Today.....ONLY AT WILEY'S. To sign up for stage time to showcase, work on your act, or just check it off your bucket list, email: wileyssundaycomics@gmail.com . 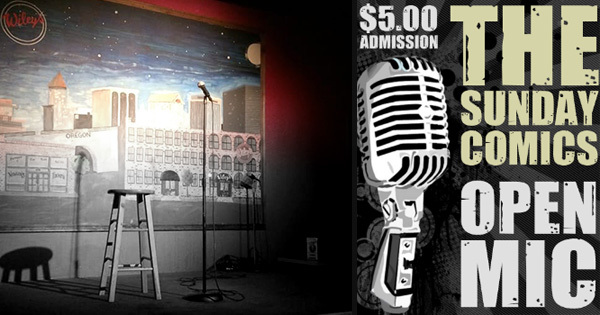 Find more events like "Wiley's Sunday Comics"
Dayton's First and Ohio's Oldest Comedy Club In The Historic Oregon District. Several generations have met the Stars, and the Stars of Tomorrow at Wiley's.